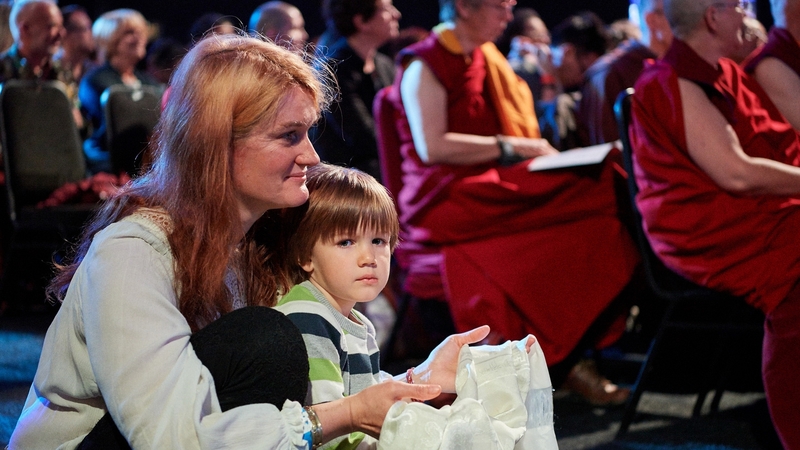 May I hold them as supreme and cherish them. 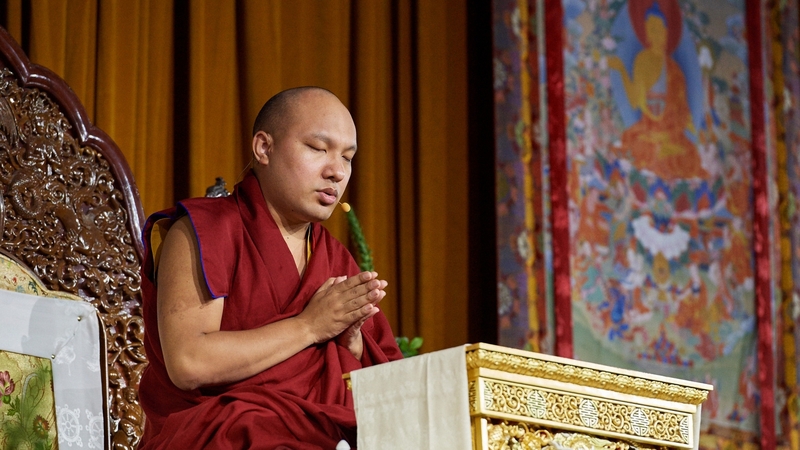 To illustrate his point, the Karmapa gave the example of the powerful and vast oceans, which cover a good deal of the planet and still hold the lowest place, allowing all the rivers to flow into them. 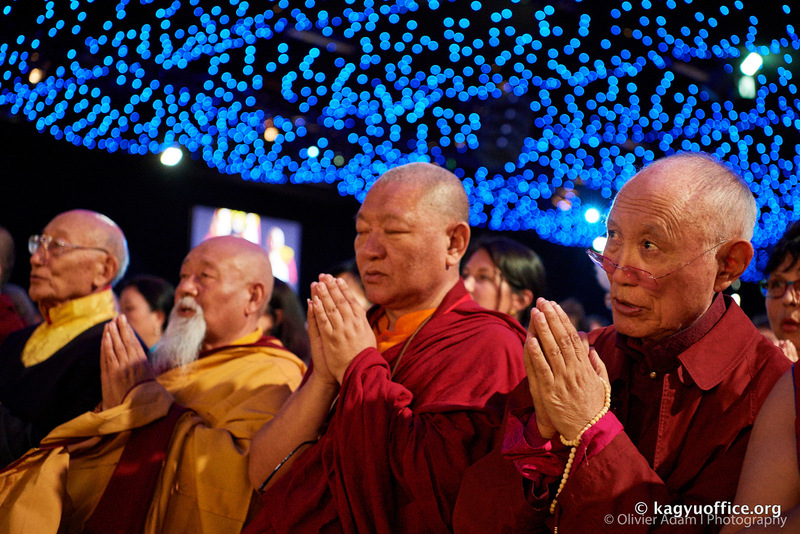 If they were elevated, the oceans would drain dry. 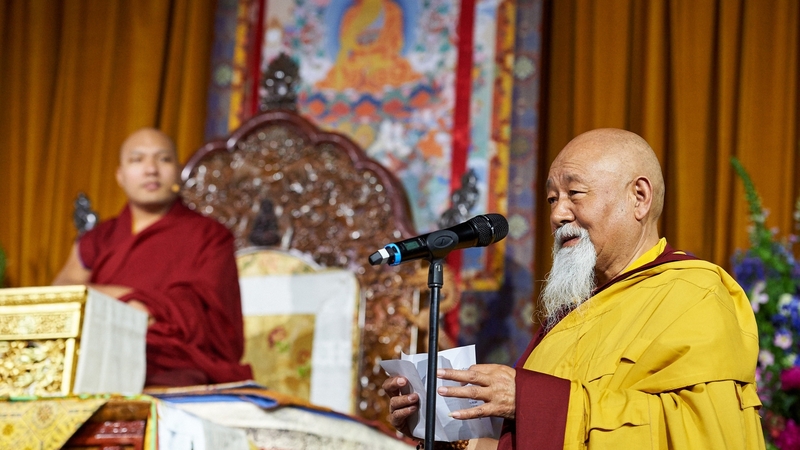 Similarly, if we train ourselves in humility, anyone we meet becomes an opportunity for this practice, and virtuous qualities will naturally flow into us. 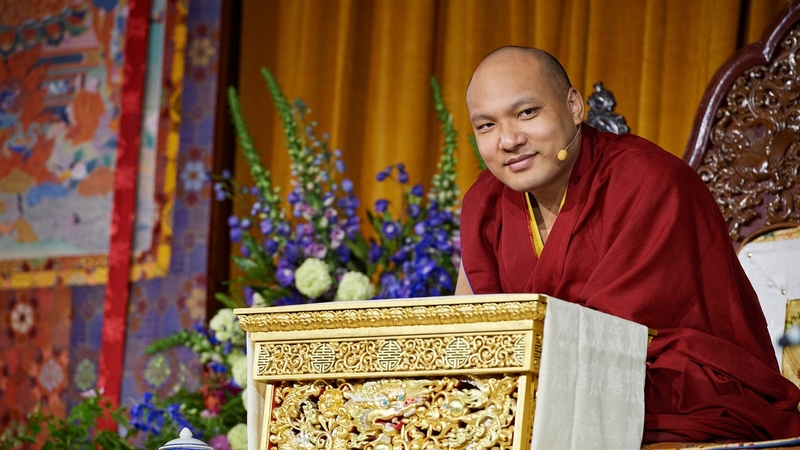 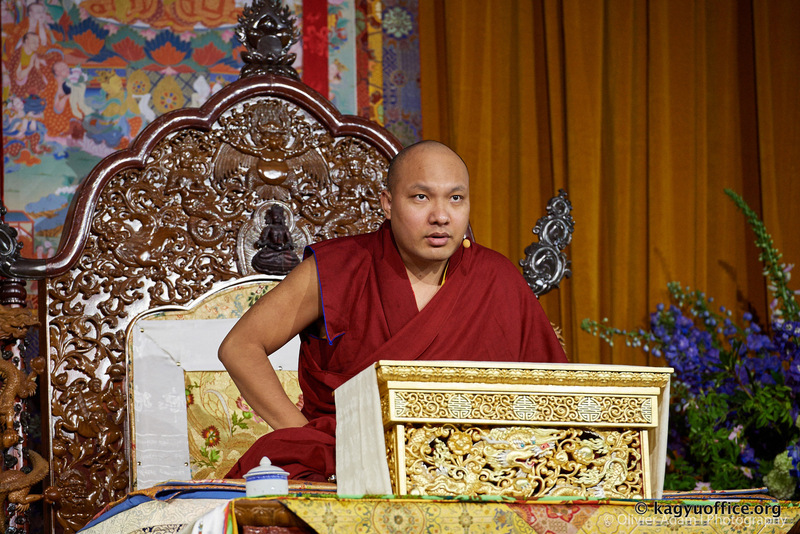 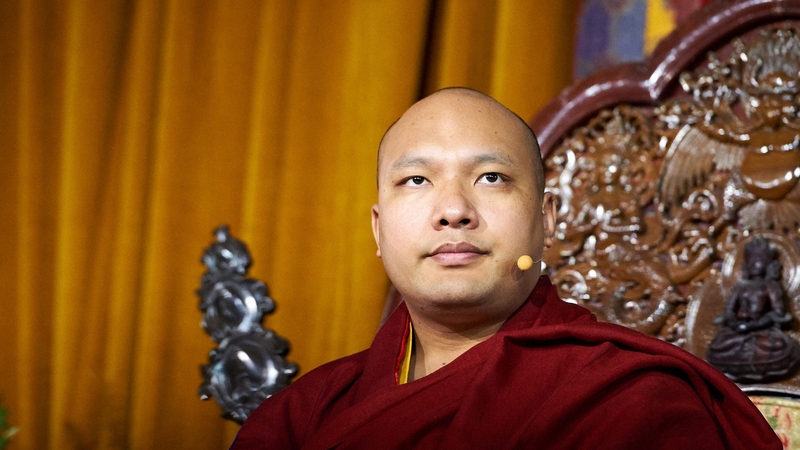 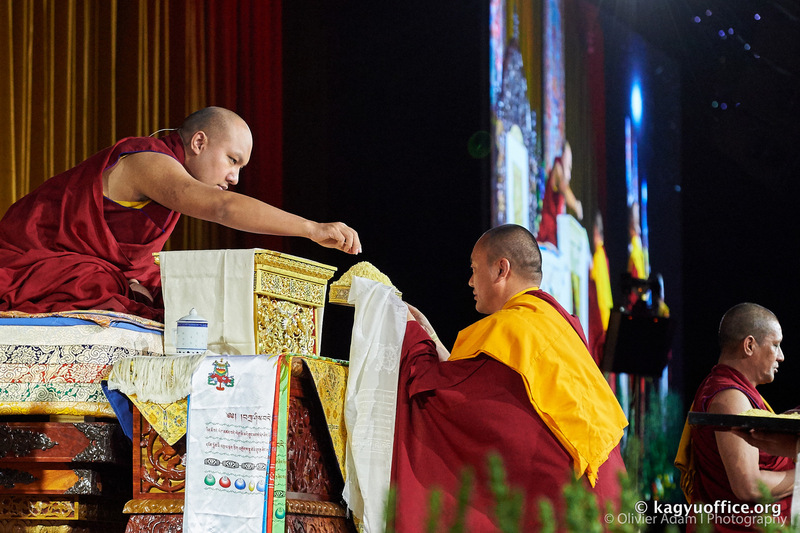 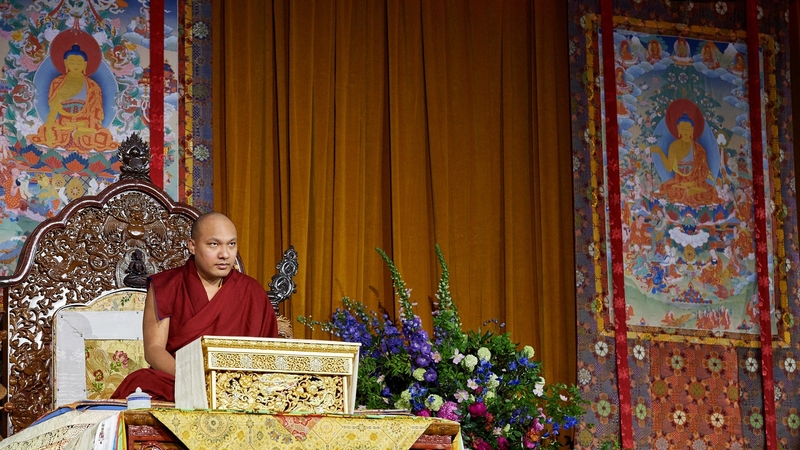 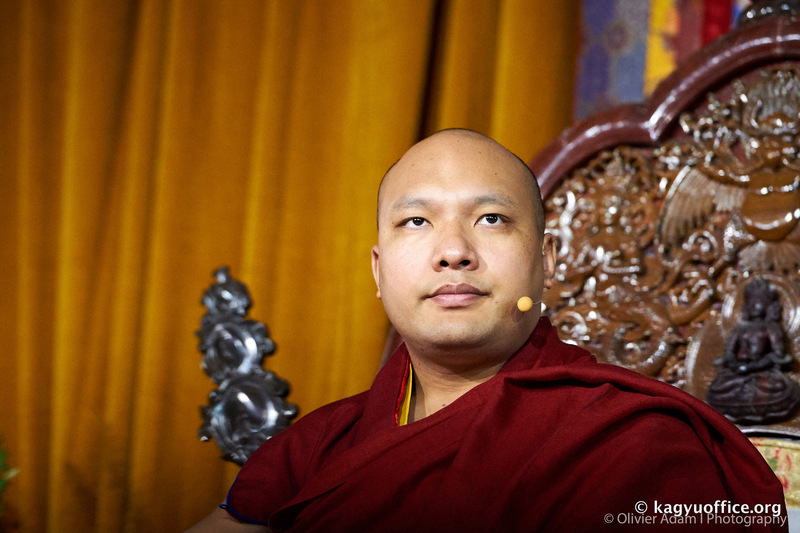 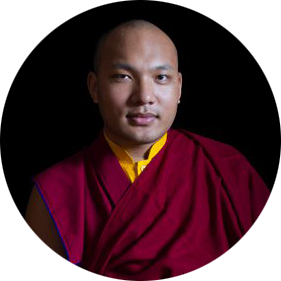 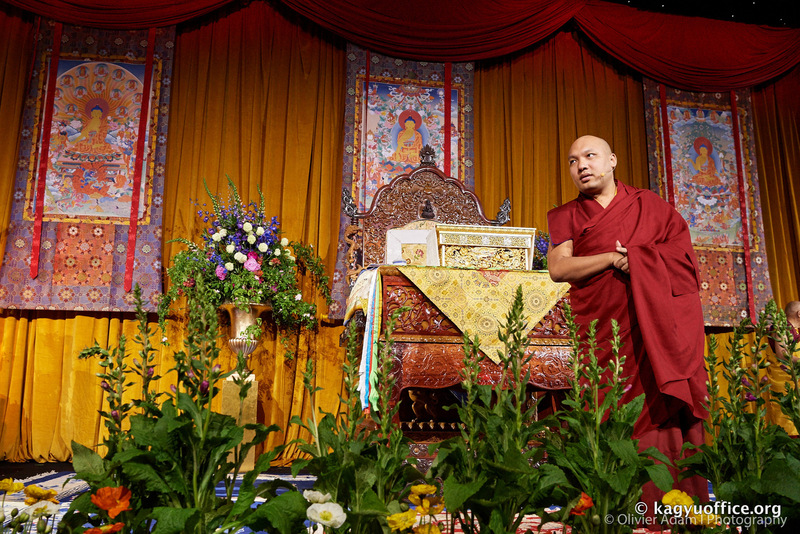 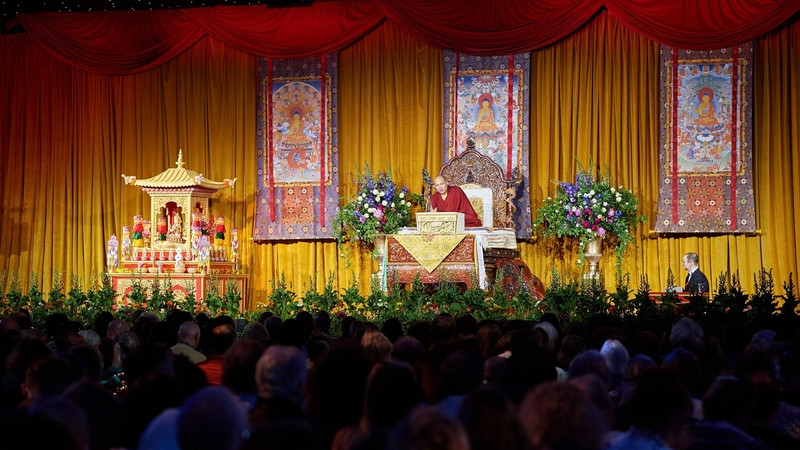 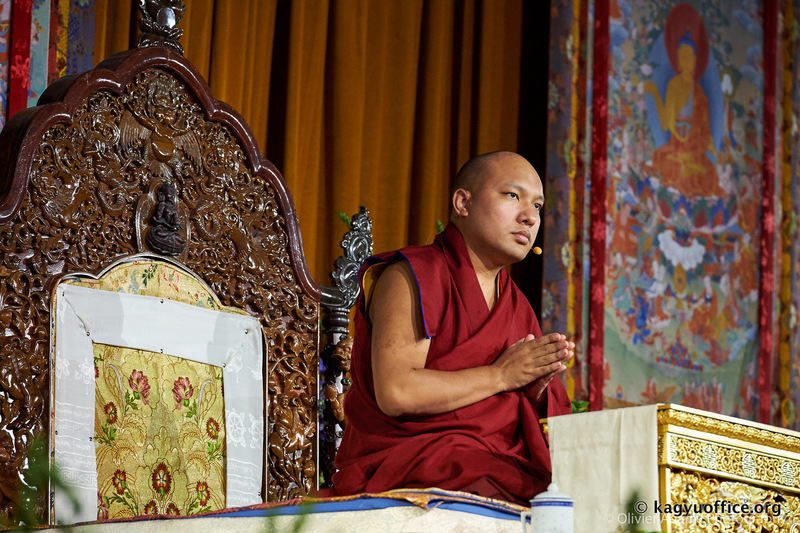 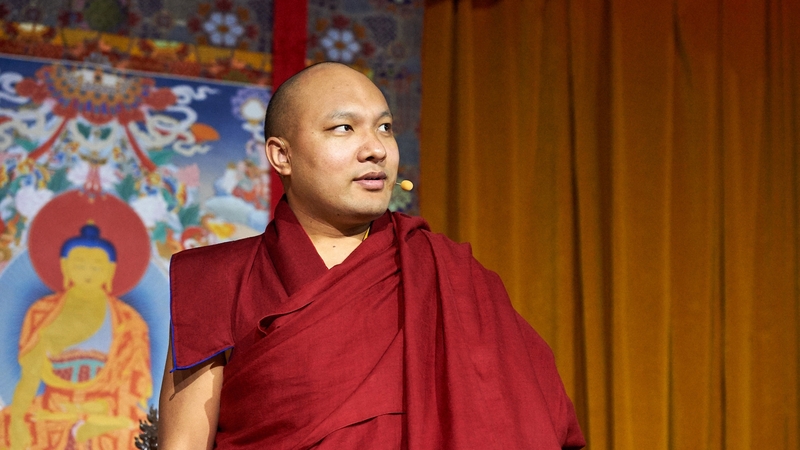 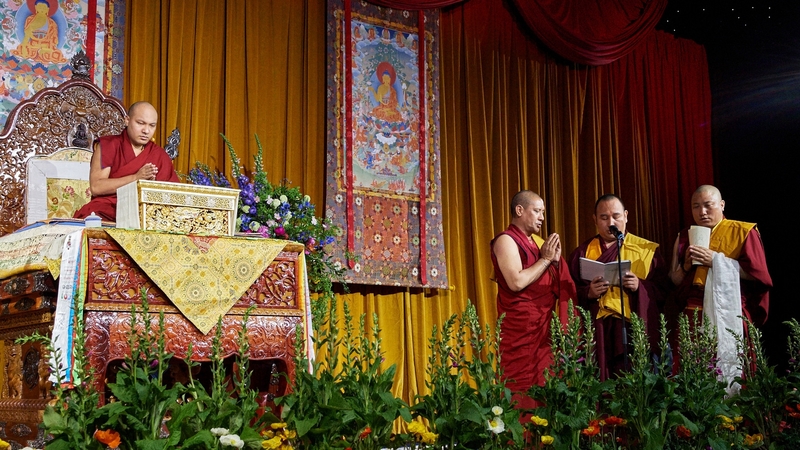 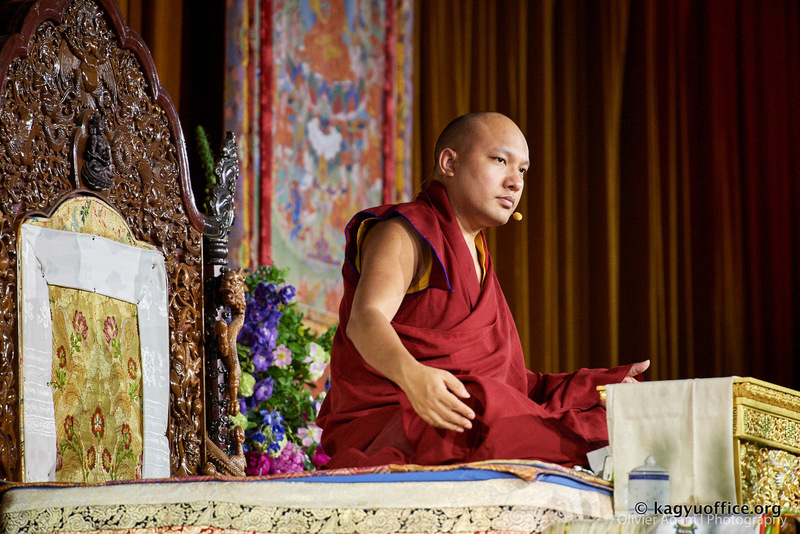 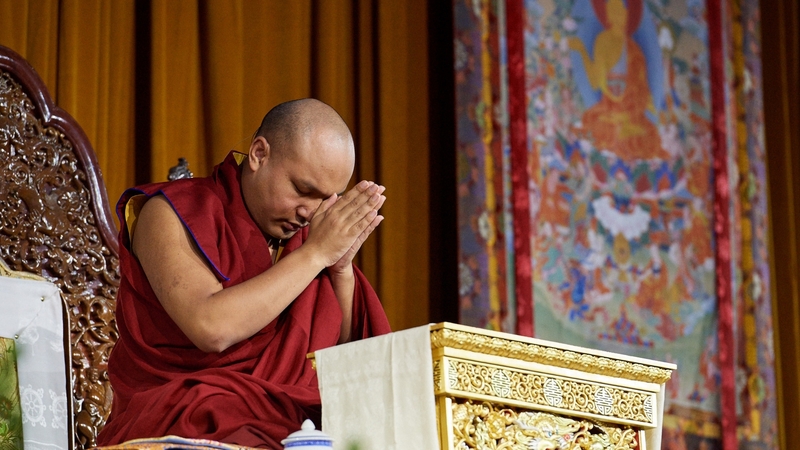 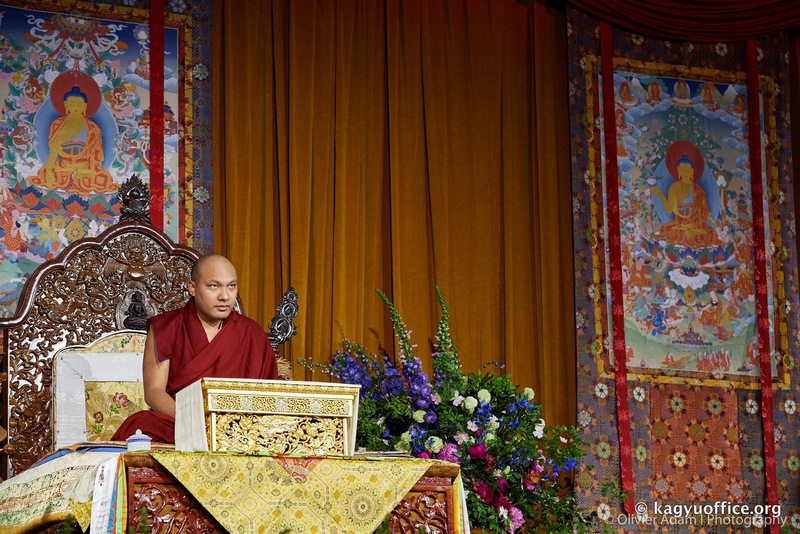 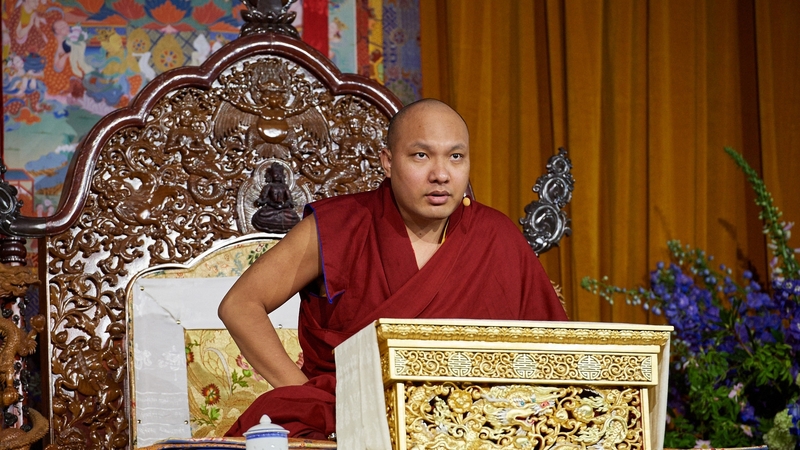 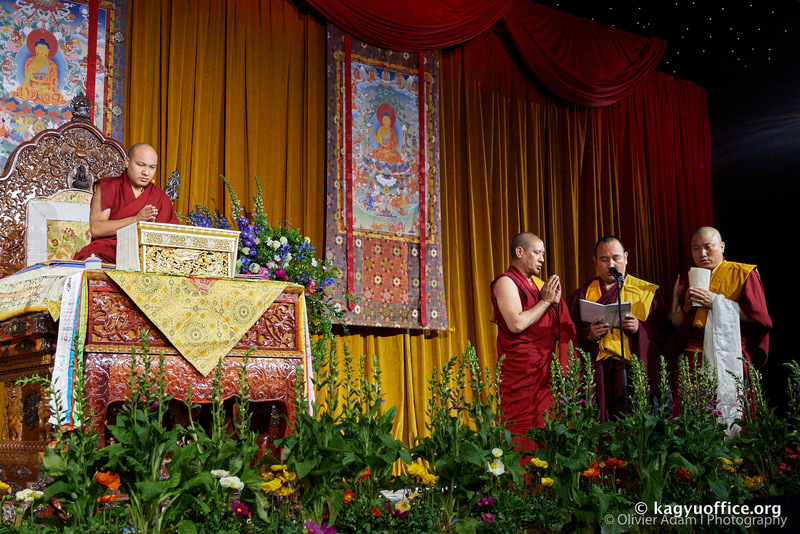 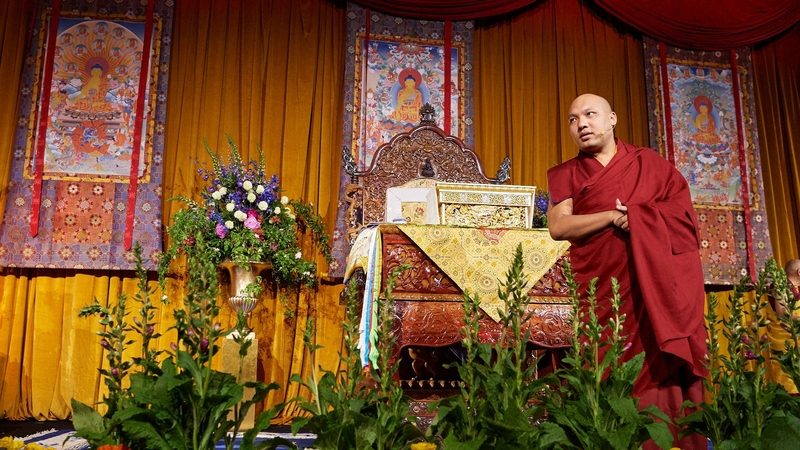 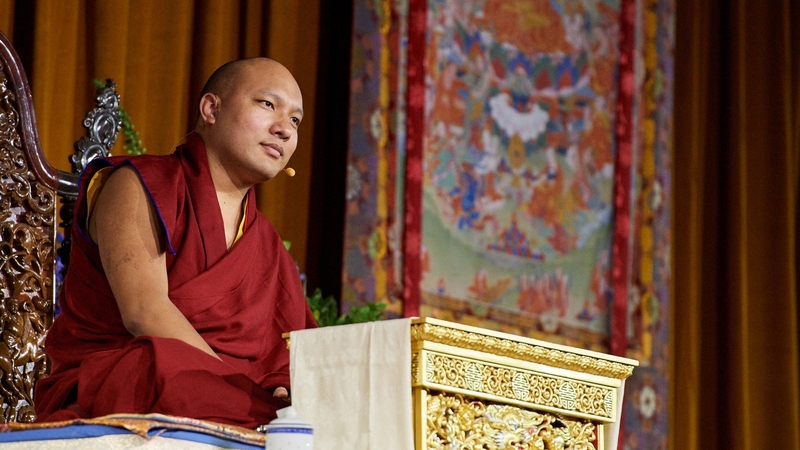 To illustrate pride, the opposite of humility, the Karmapa gave the example of pouring water on a ball. 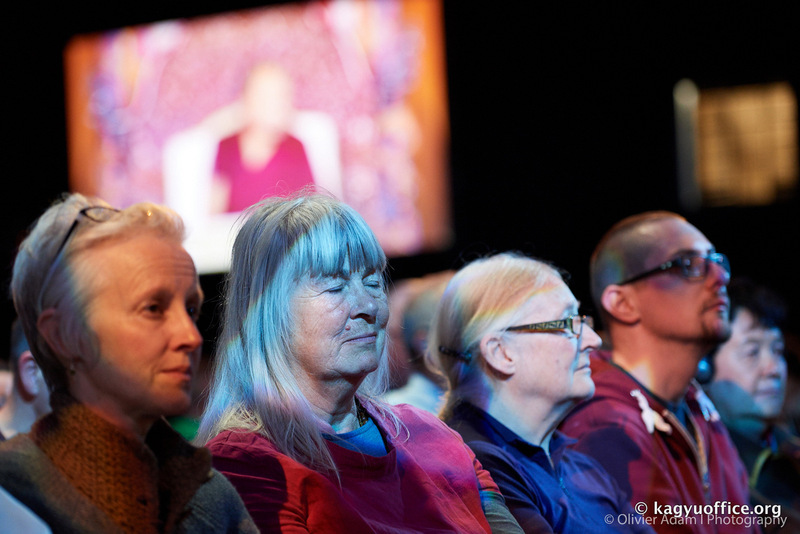 When we are puffed up with ourselves, there is no space for improvement, which we deem unnecessary, so it is very difficult to increase positive qualities as we miss the chances. 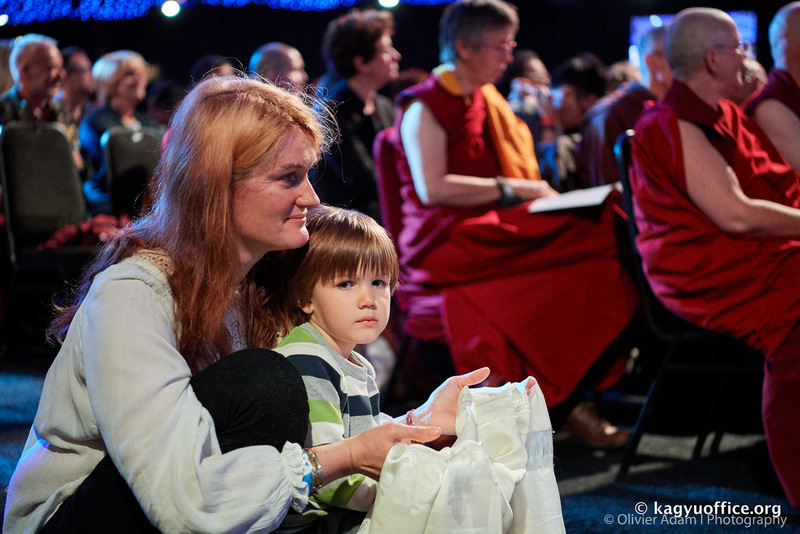 Being humble, holding the lower place, opens up a pathway through which we can learn more and develop. 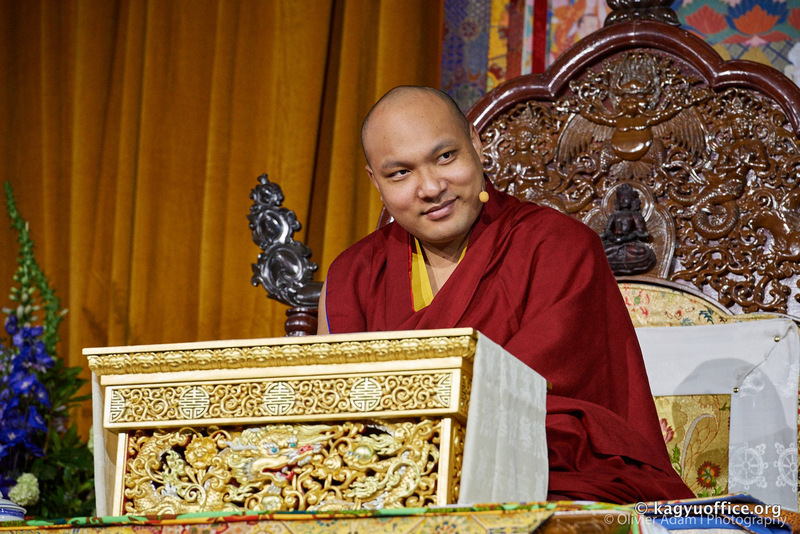 The Karmapa then read the third verse:< In all activities I will examine my mind stream. 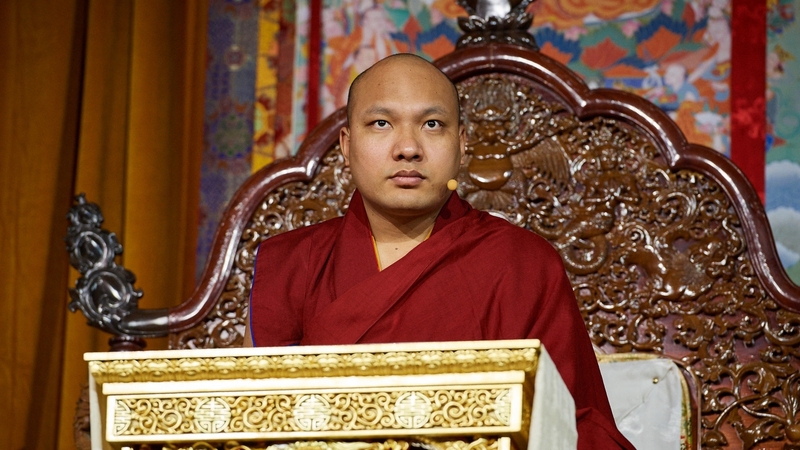 May I energetically face and reverse them. 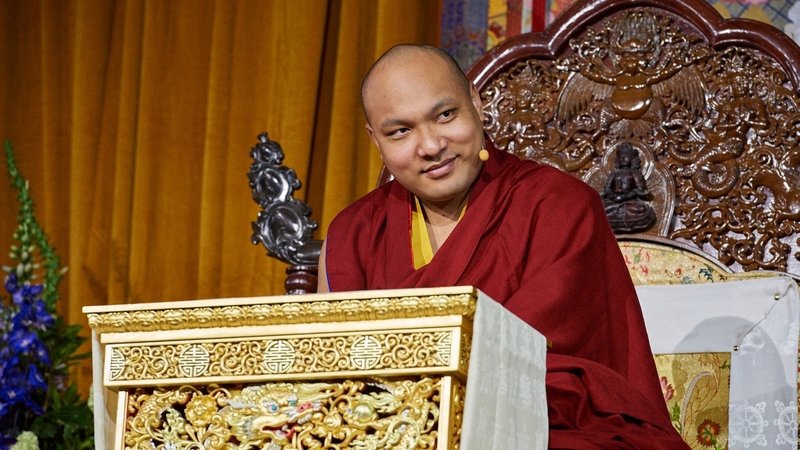 Offering his advice, the Karmapa counseled, “We need to have a plan in place for how we will deal with any given situation. 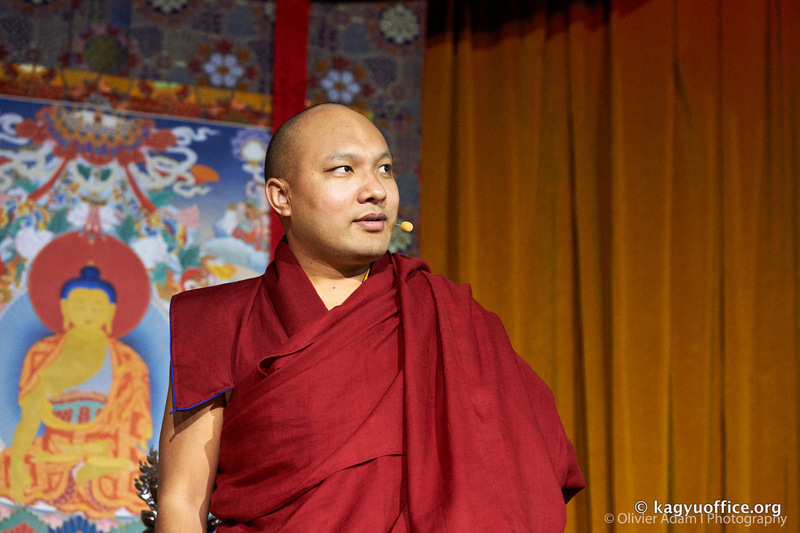 If we let the mind go where it wants to go, it will turn stubborn. 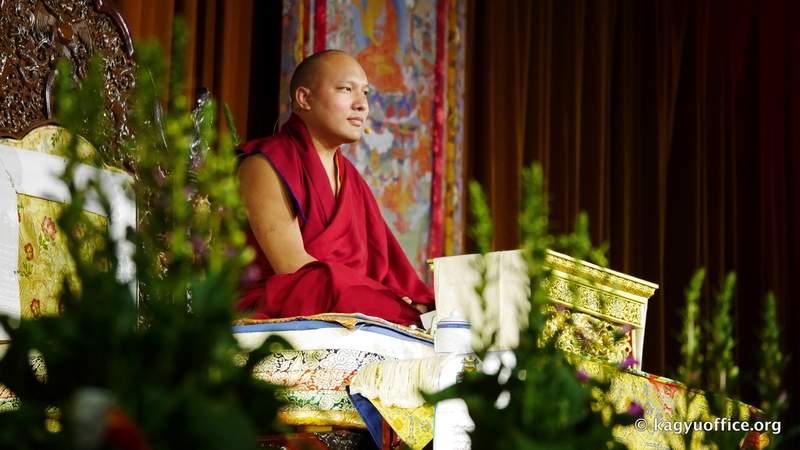 There is a saying in Tibetan: ‘Appearances are skilled at deception and the mind is like a small child following after them.’ Instead of letting mind be fooled by appearances, we should take care of it like a small child, not letting it do whatever it wants; rather, we should examine carefully to discover the state of our mind. 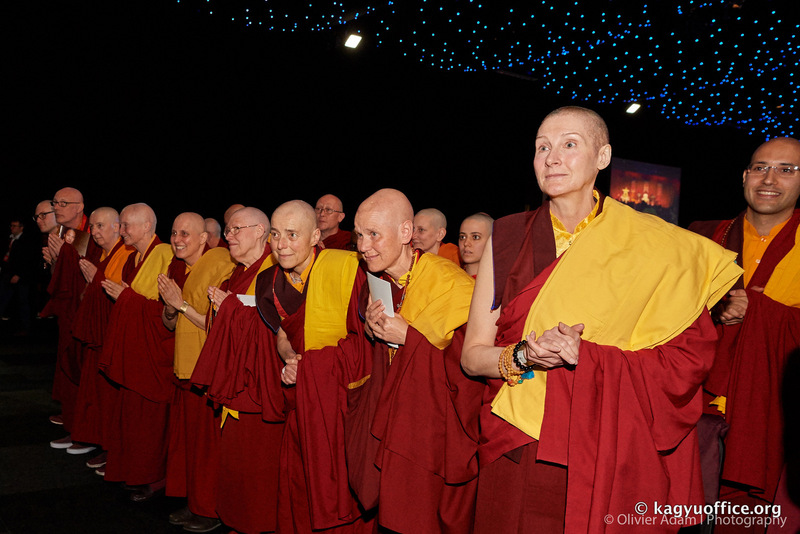 May I cherish them as something difficult to find. 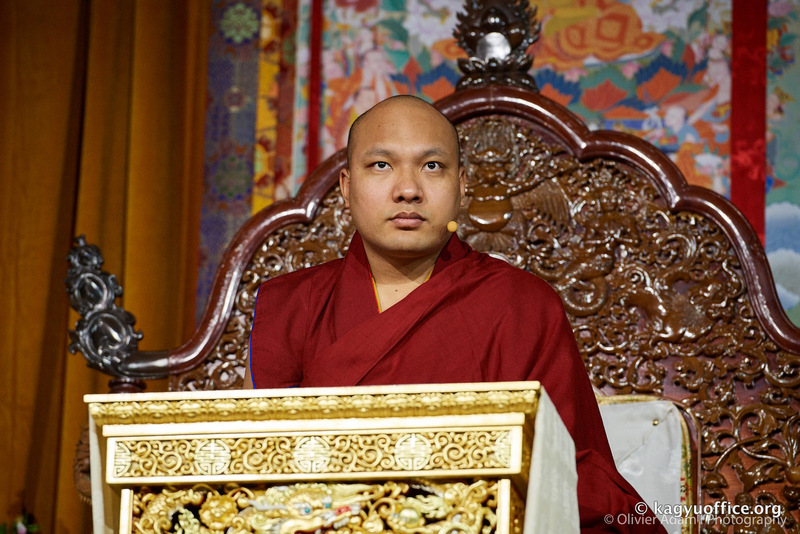 The Karmapa then left the remaining verses for the next day and responded to written questions. 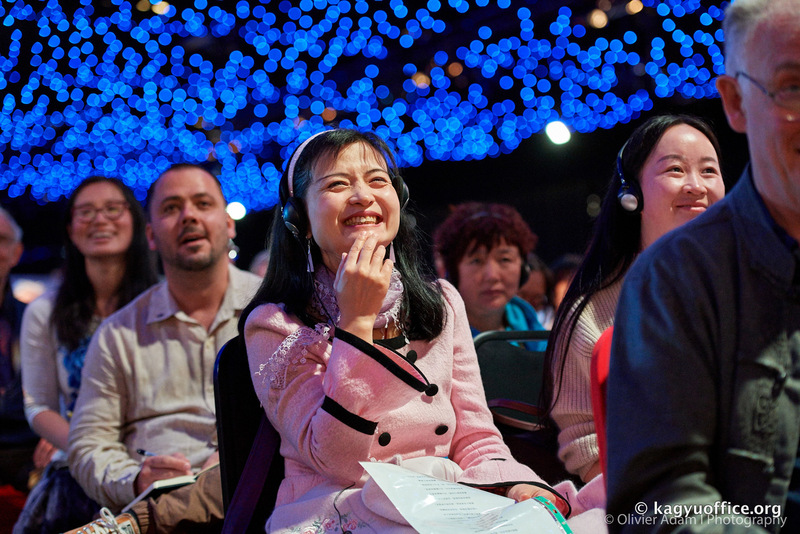 Q: Do you talk to birds in this lifetime? 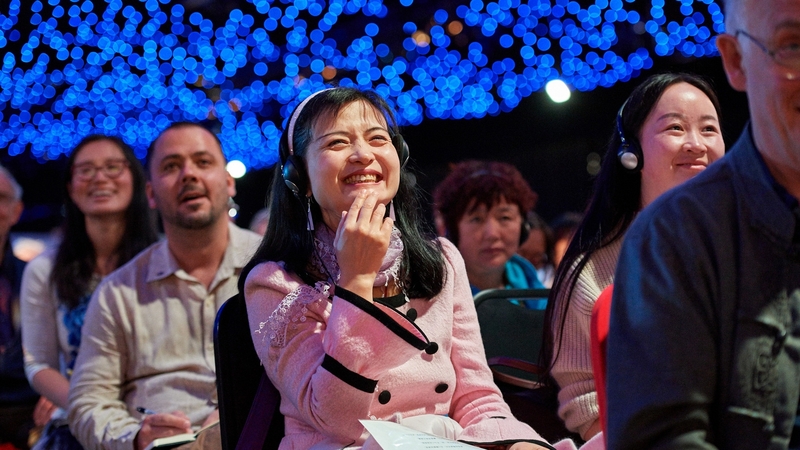 What do they say? 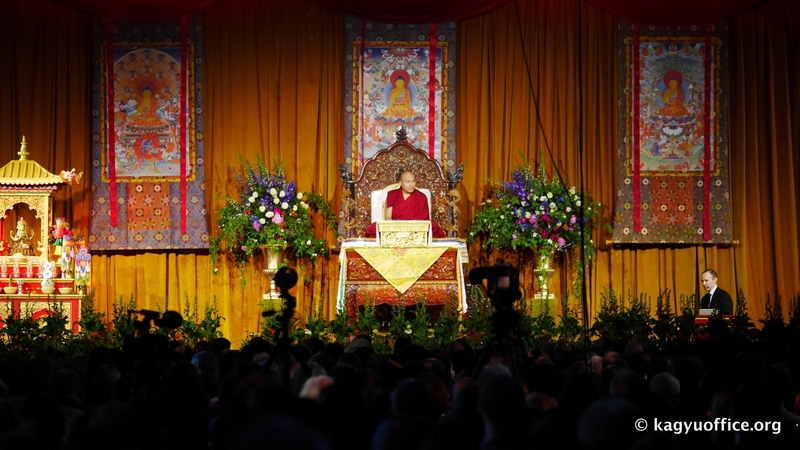 Q: I have been practicing Dharma for more than forty years and was expecting the world to be better toward the end of my life. 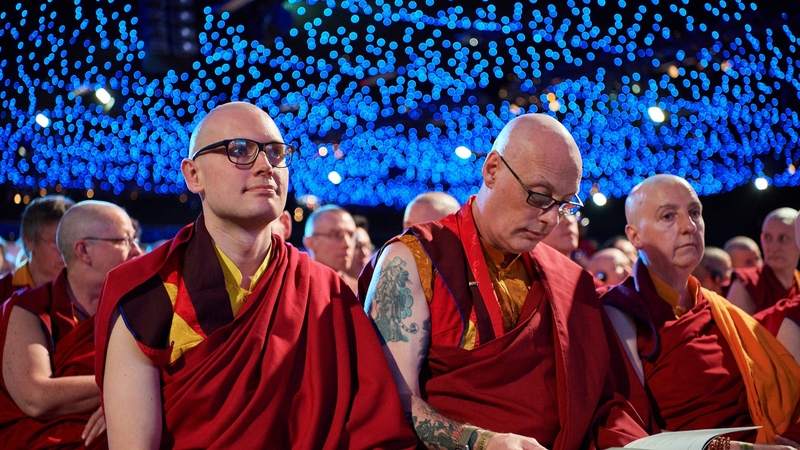 Could you explain where I went wrong? 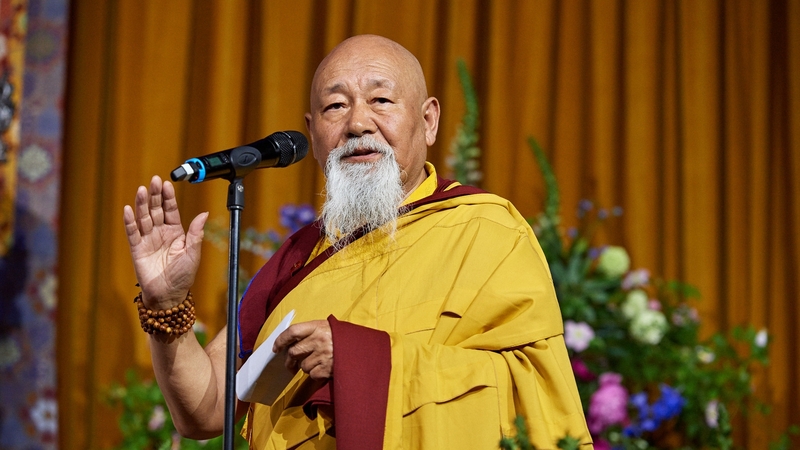 A: “It is difficult to make the whole world a better place, and sometimes our hopes for how things might be are too big. 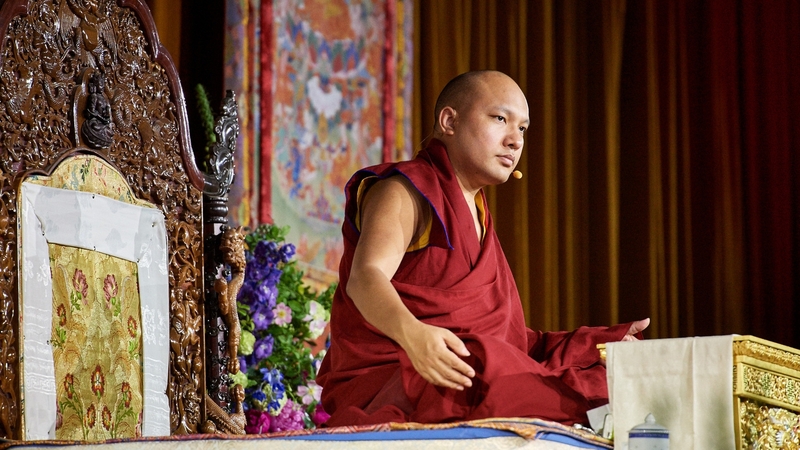 If we scale down and work with ourselves so that we become good people, then there would be one more good person in the world and one less bad one. 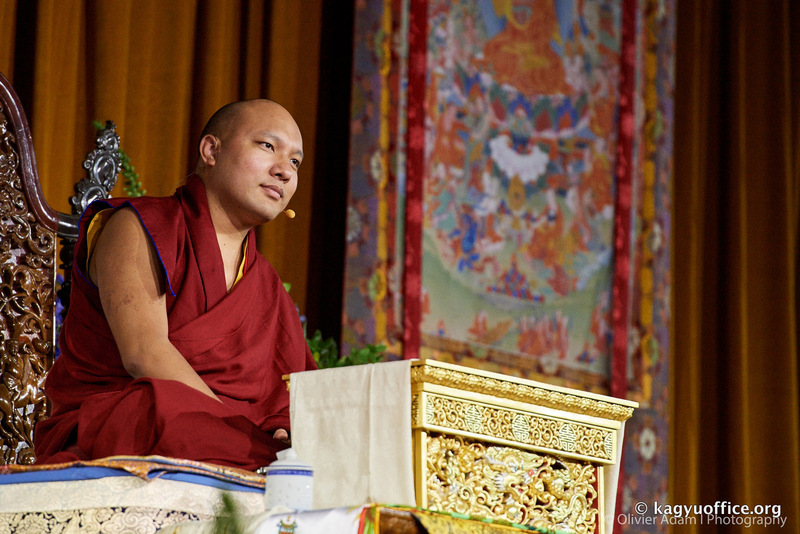 “Sometimes the way we feel depends on what we are looking at. 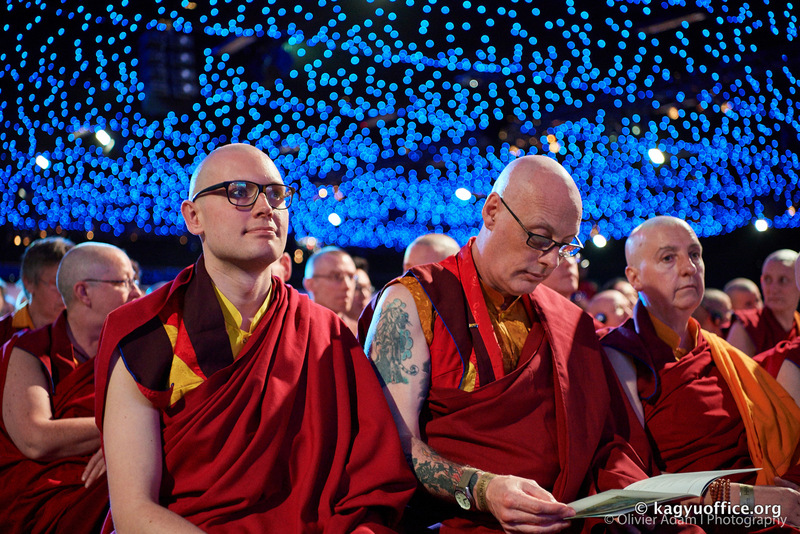 We could reflect on the state of the world and begin to lose hope. 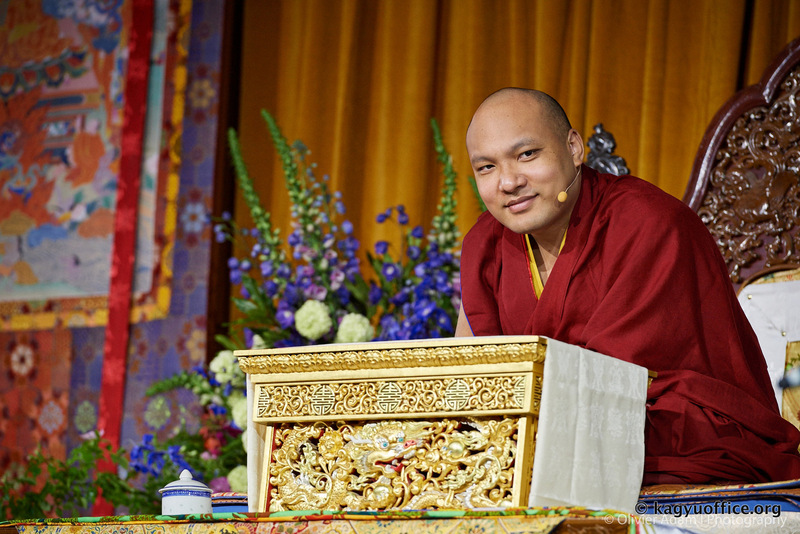 On the other hand, we could see one person practicing compassion or having a good heart, and that could encourage and inspire us. 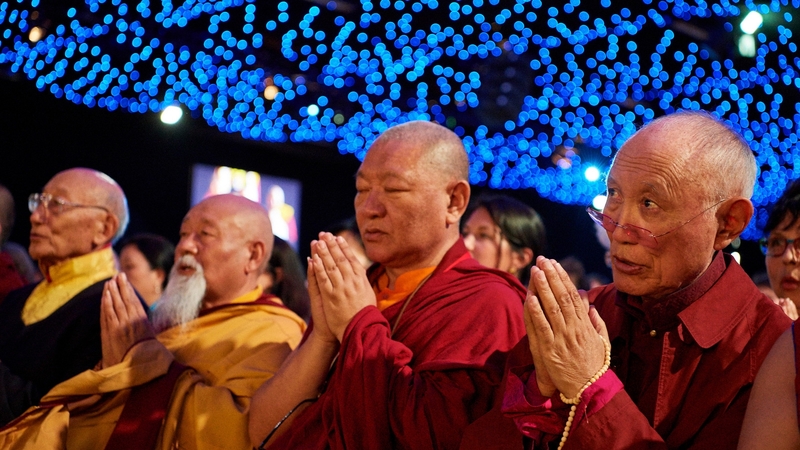 Q: How to deal with racial discrimination? 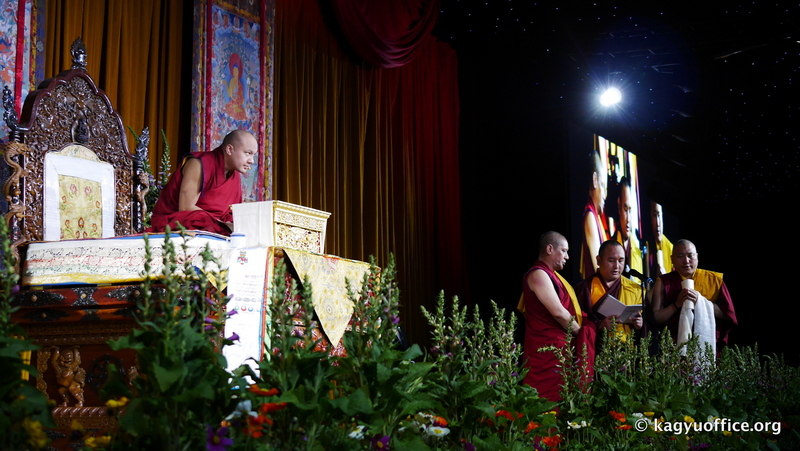 On this positive note, the question and answer session drew to a close. 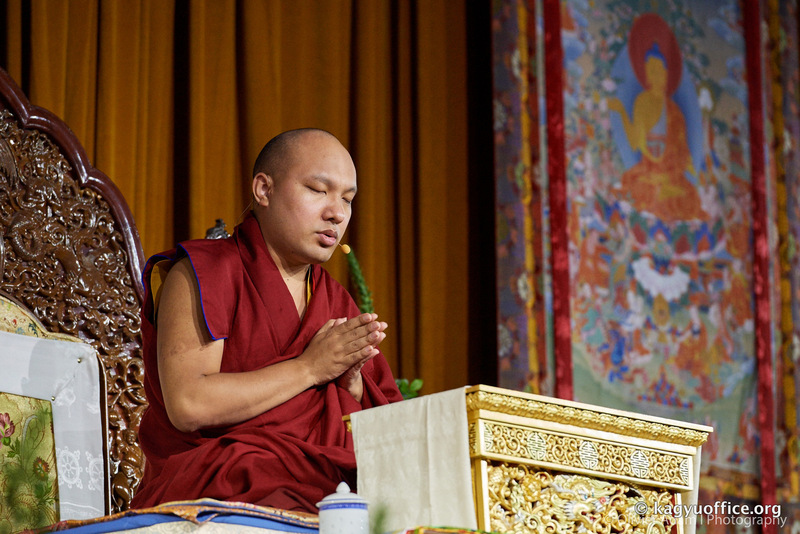 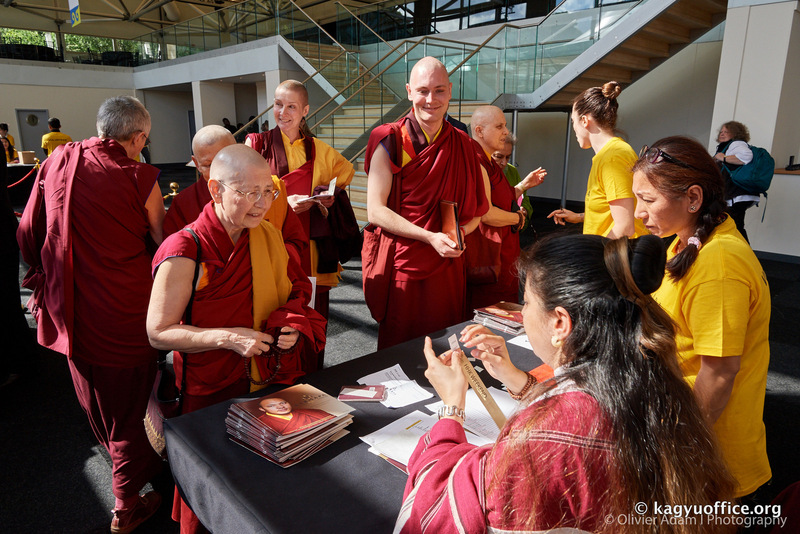 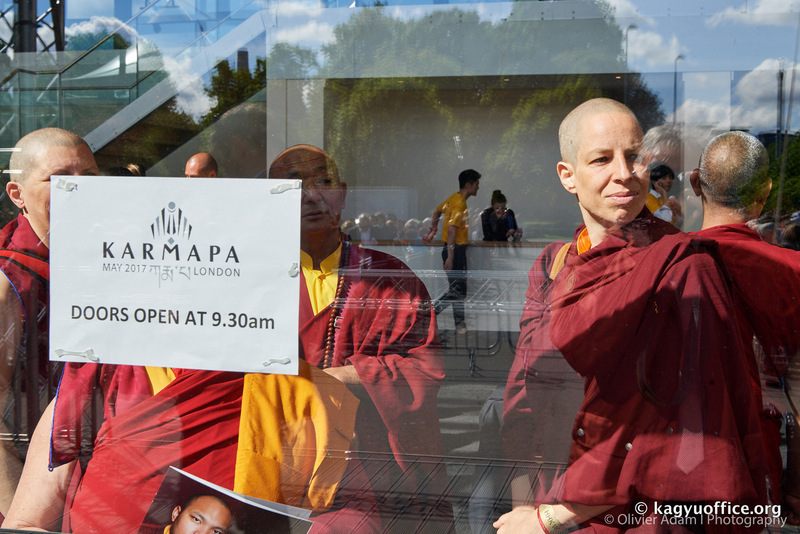 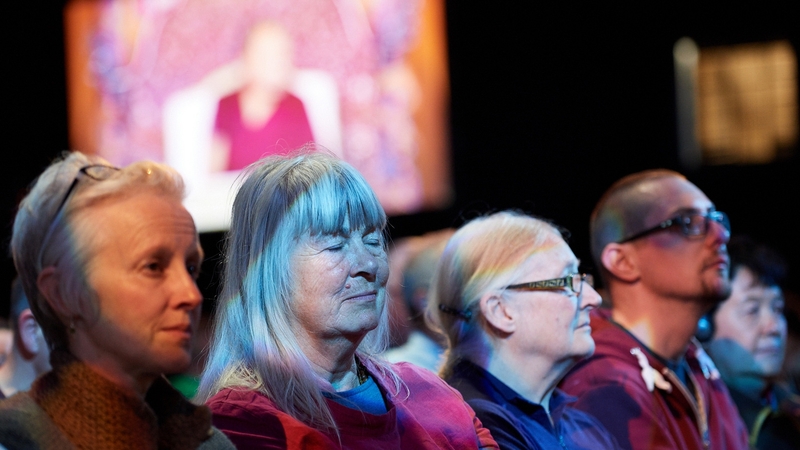 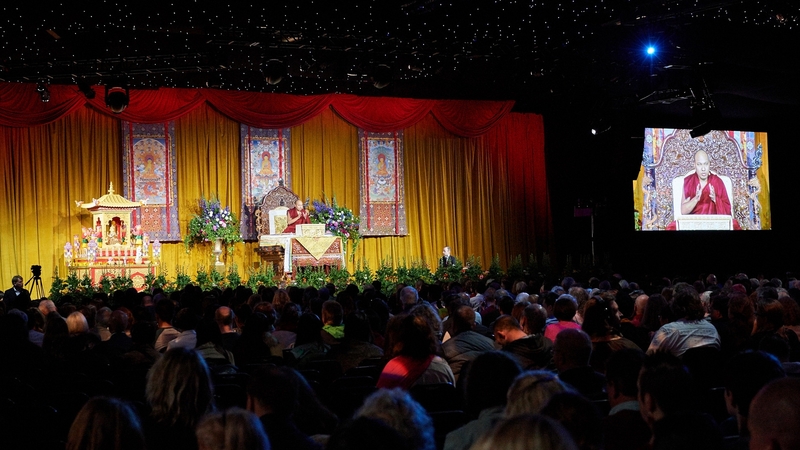 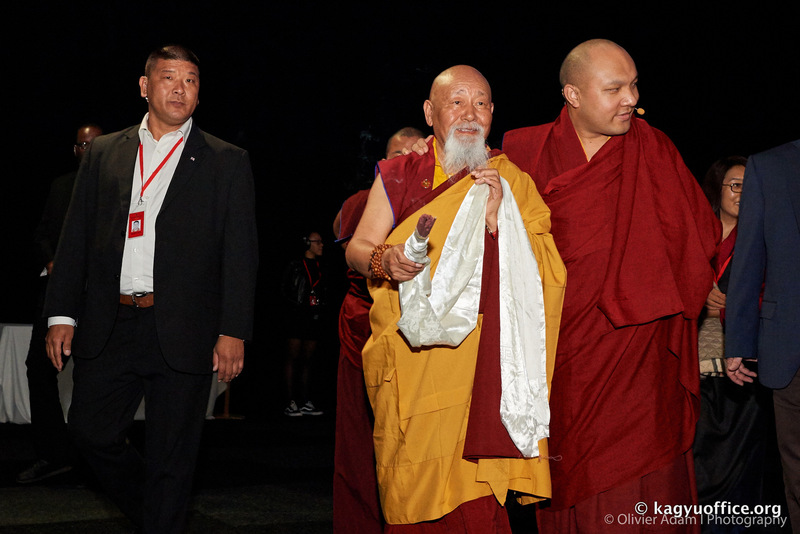 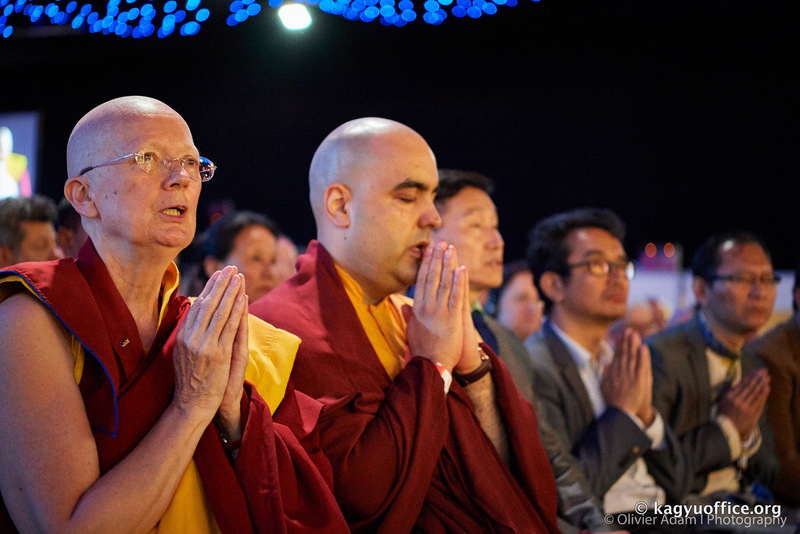 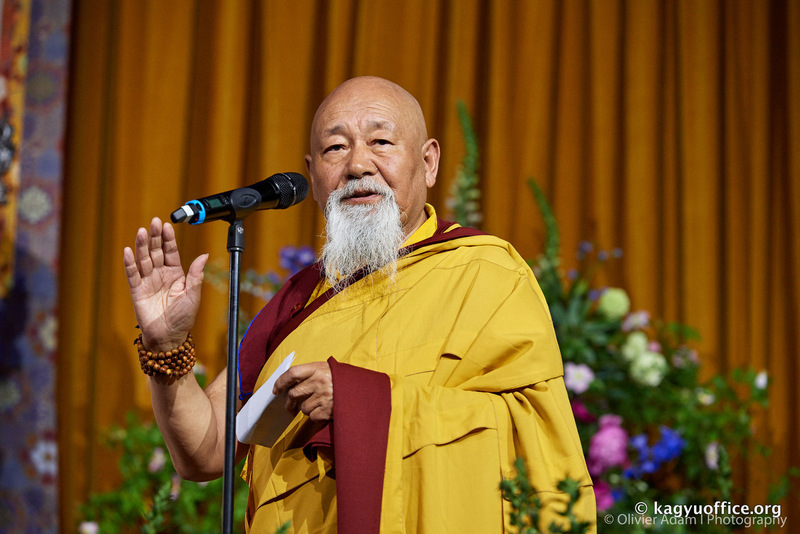 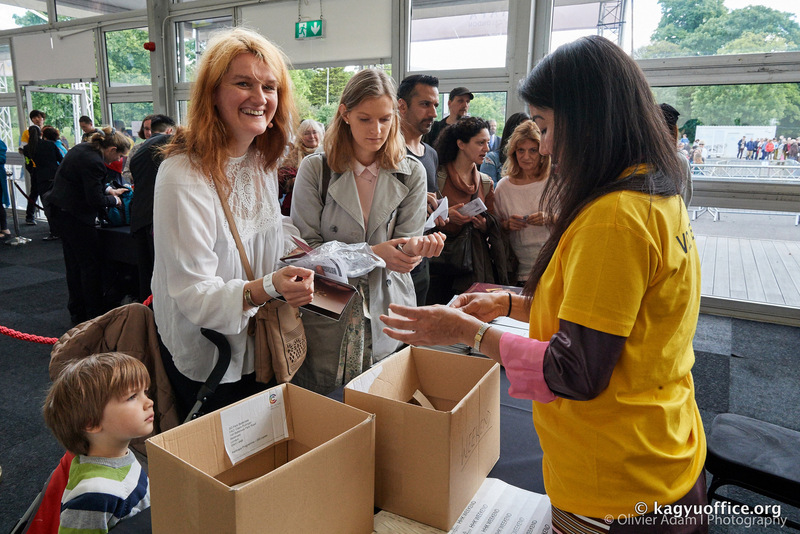 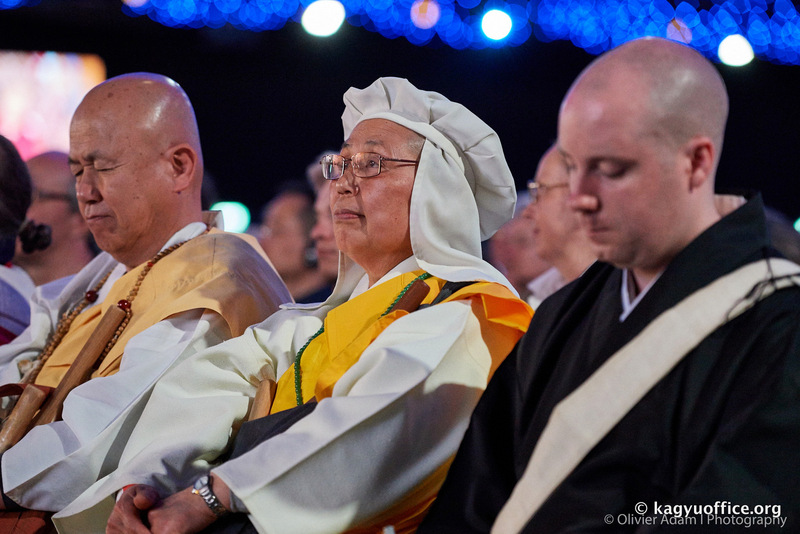 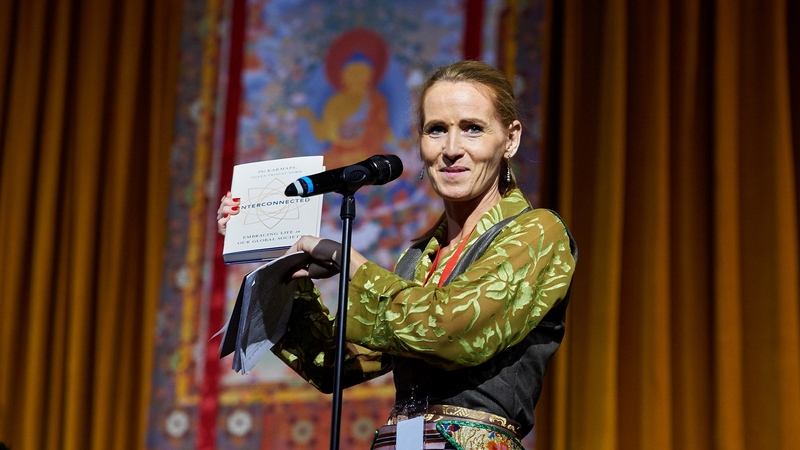 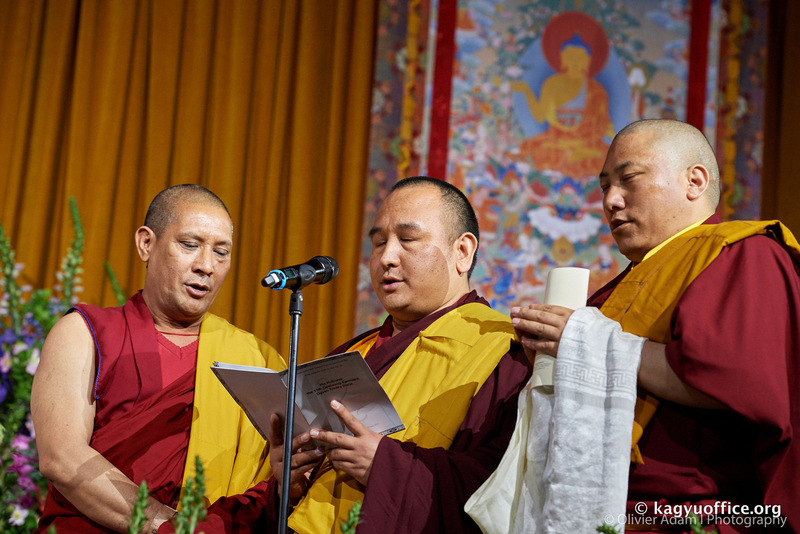 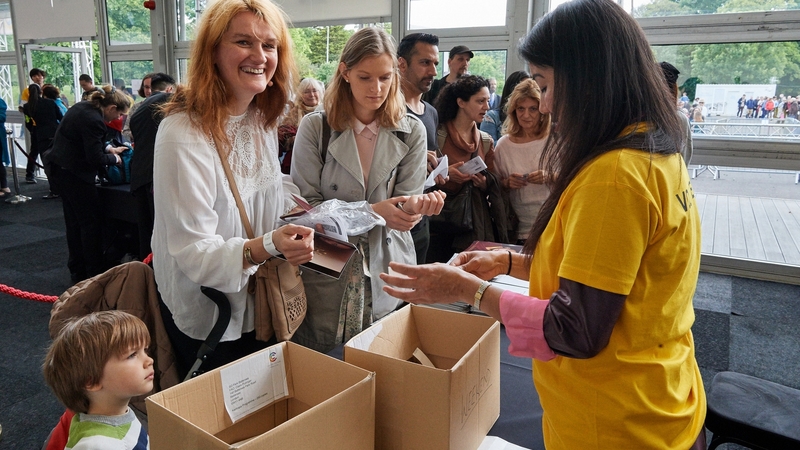 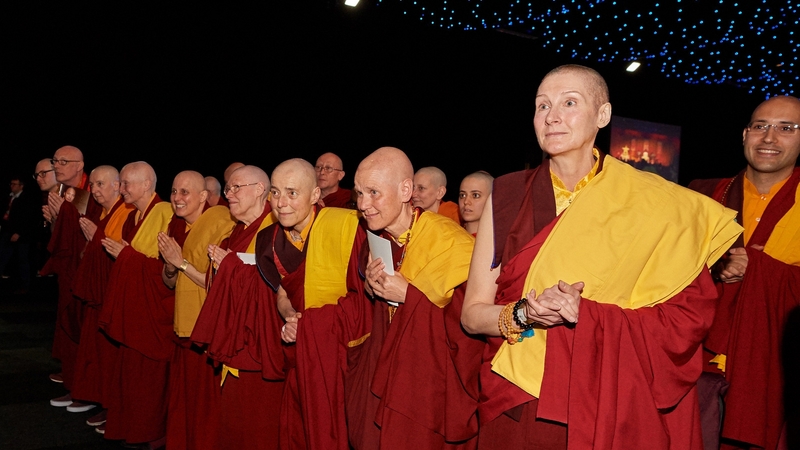 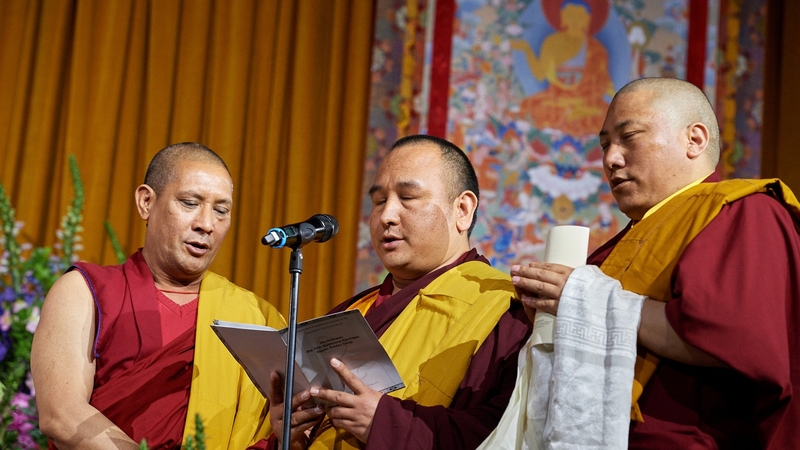 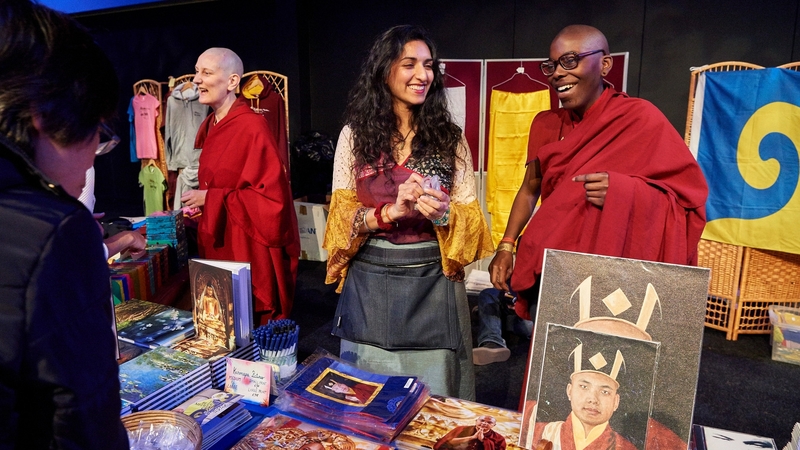 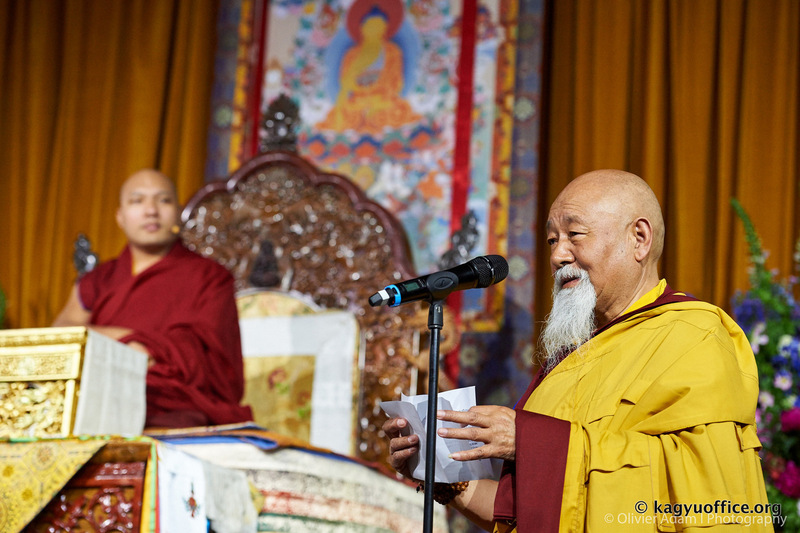 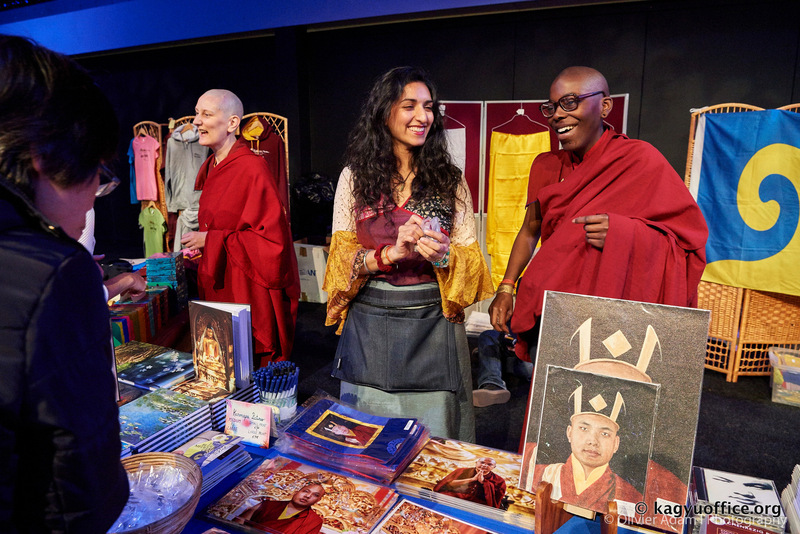 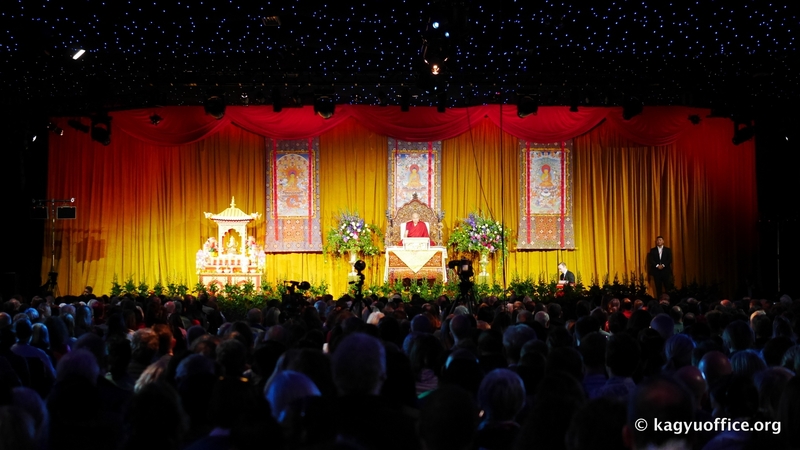 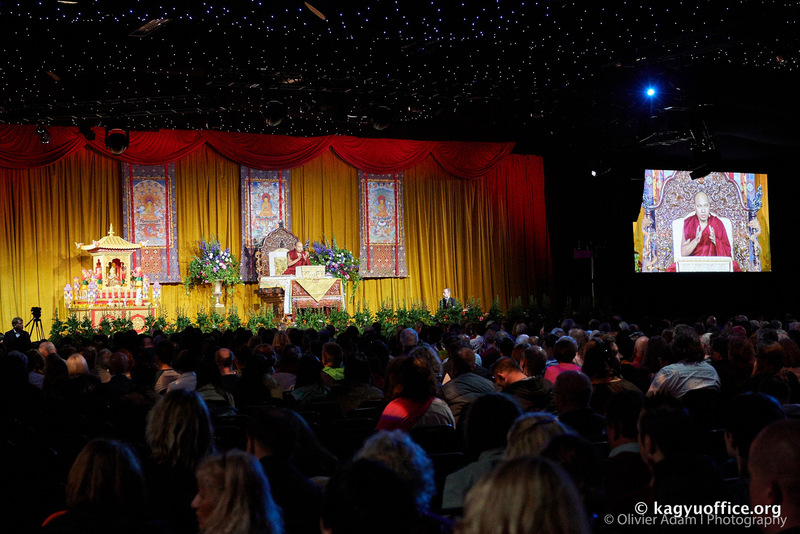 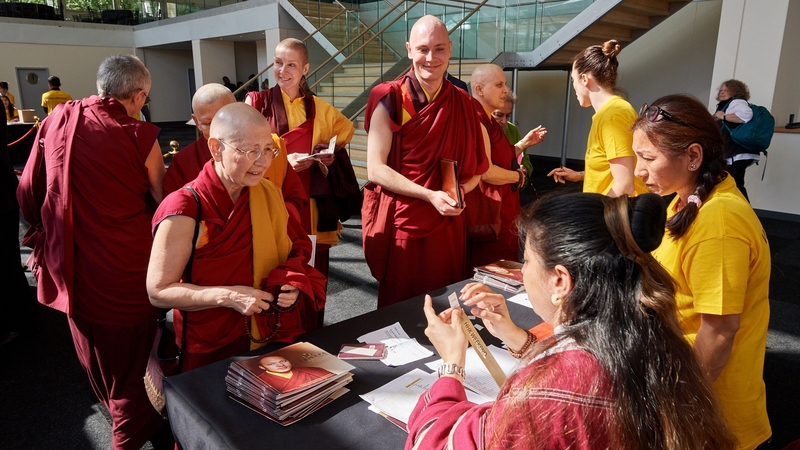 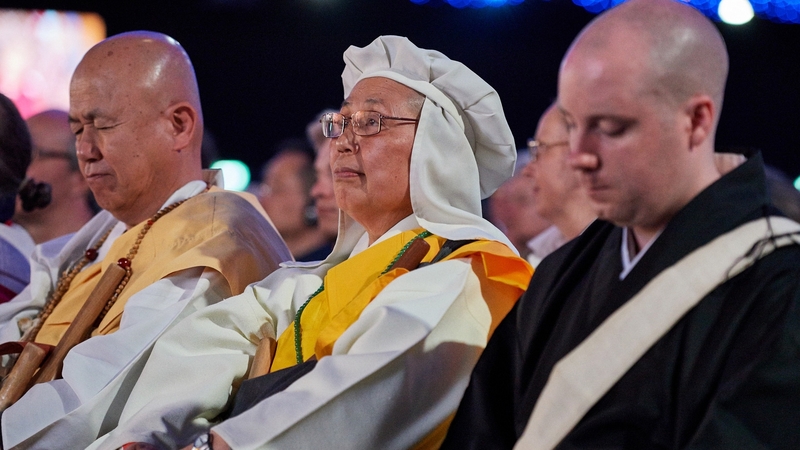 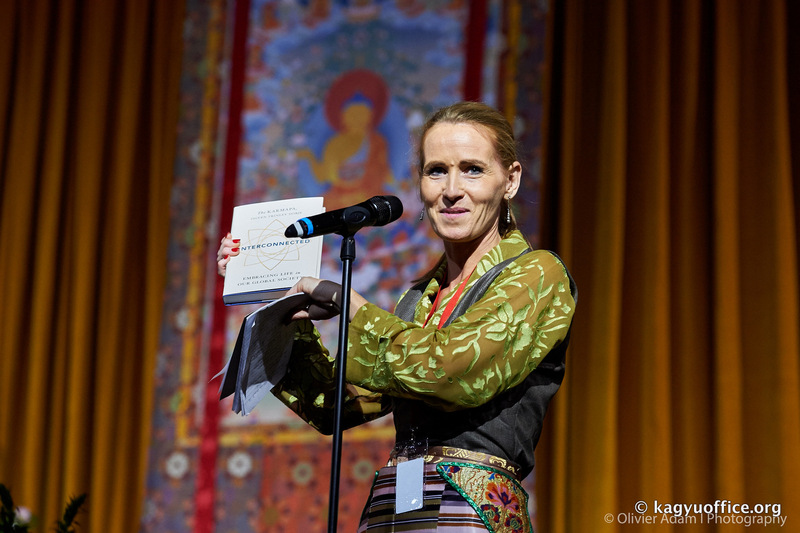 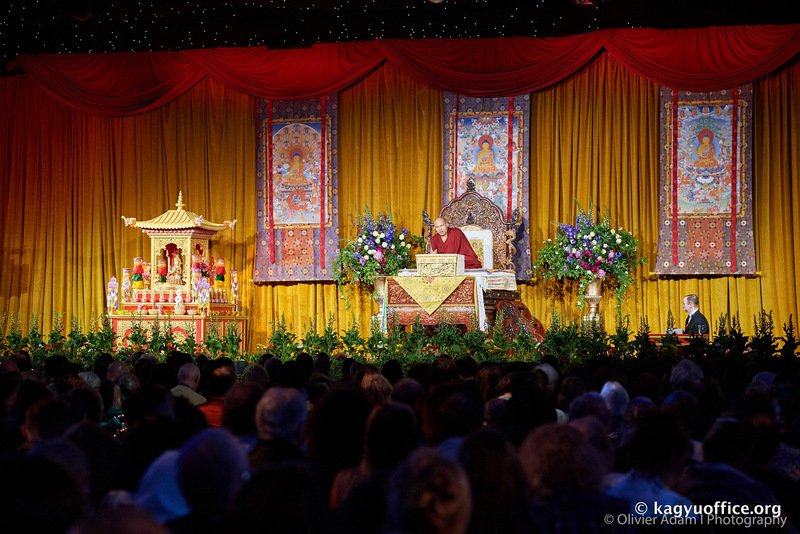 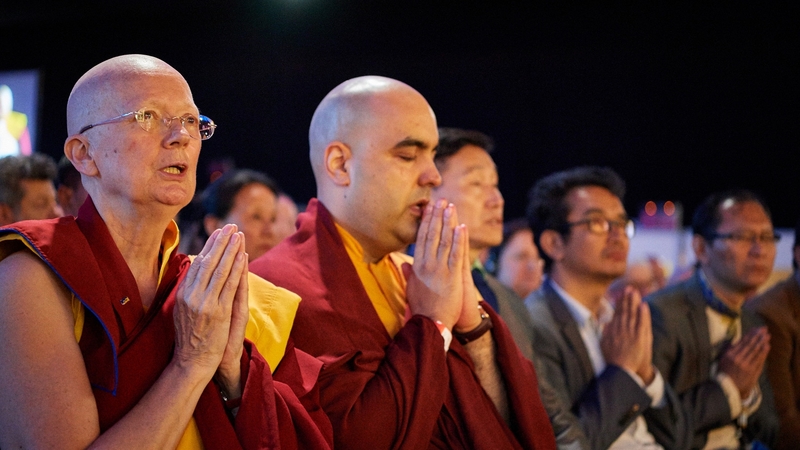 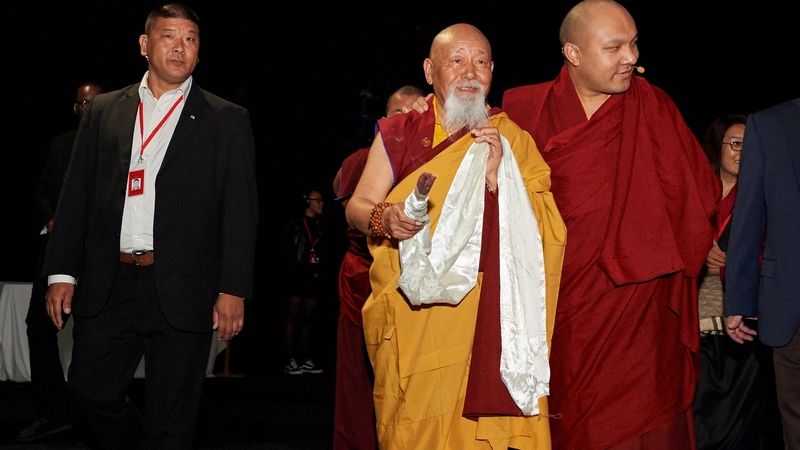 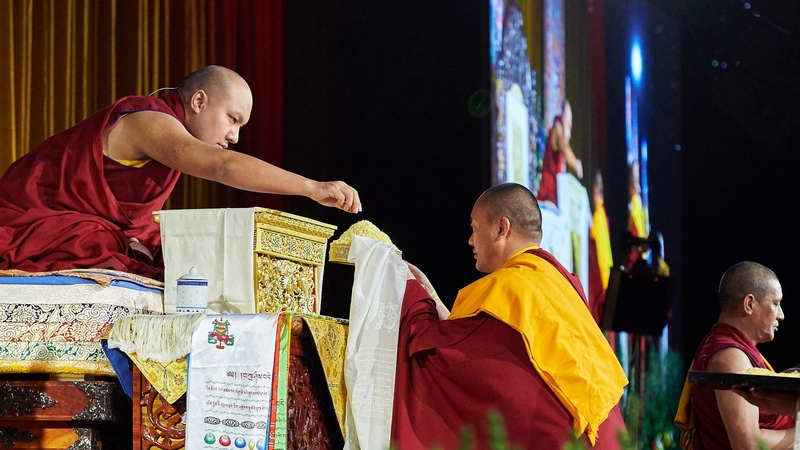 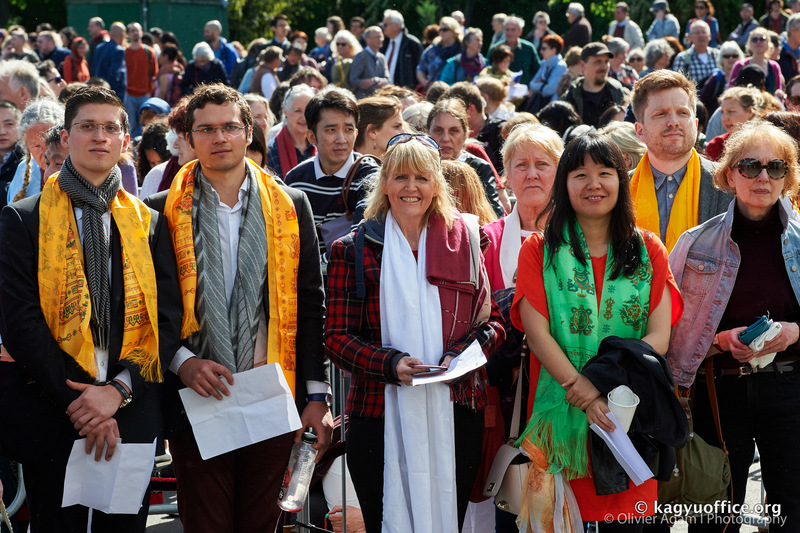 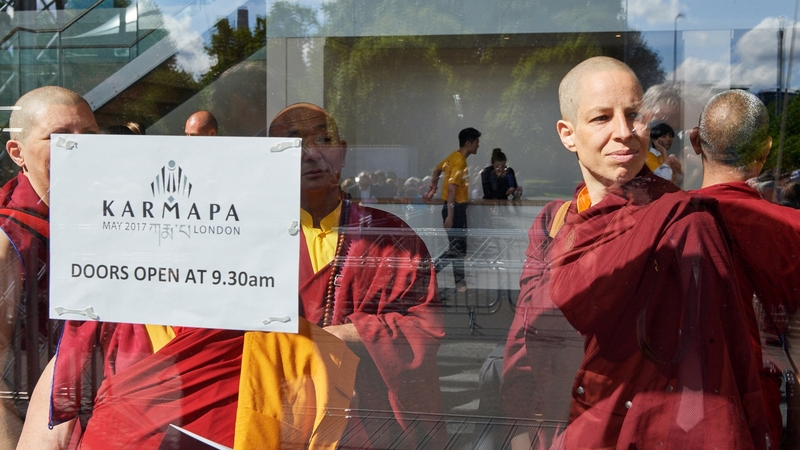 After the teaching, following through on the theme of connection, groups of disciples from individual countries were arranged, and the Karmapa moved from one to another, sitting down with people to take their questions and standing to receive their khatas. 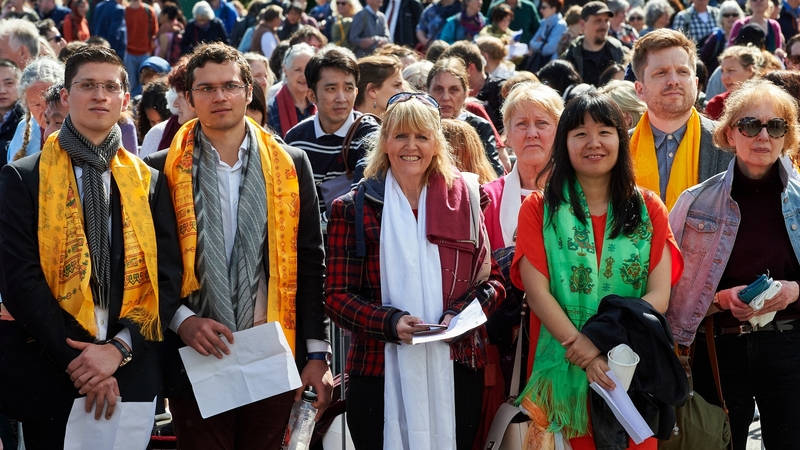 Finally he donned the yellow knit shirt of the volunteers and posed with them lined up on the stairs for a final photograph.